Egyptian collector Shafik Gabr believes that Orientalist paintings can further understanding between the West and the Arab world. This article originally appeared in the April issue of Art & Antiques Magazine as “The Bridge-Builder”. To many in the West, the Orientalist art of the 19th and early 20th centuries is either colonialist kitsch or a charming time capsule of Academic painting. But to Shafik Gabr, an Egyptian tycoon and one of the world’s biggest collectors in the field, Orientalism is a potential bridge-builder between the Middle East and the West, something of real cultural importance, particularly now, with the struggle for democracy in the Arab world reaching the crisis point. 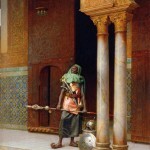 Orientalist artworks are also, as we are now realizing, valuable historical documents. “The Middle East has always been a crossroads between these worlds,” Gabr says, referring to East and West. “We owe the Orientalists a great debt, because although much of what they painted lives on today in our streets and villages, we constantly need to be reminded of the richness and value of our culture. For many years we Arabs did not reconcile ourselves to Orientalism. 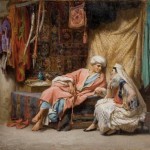 Now, from those paintings we’re getting to know about our own traditions and are owning them.” Buyers of Orientalist art, many of them Middle Eastern, are aware that it is much more than a repository of pictorial memories, precious as those are. As the region invests in museums, art institutions and art education, Orientalism is increasingly perceived as a valuable part of the region’s heritage. He points out that curiosity about the “other” is a two-way street and illustrates the point by citing two paintings in his collection. 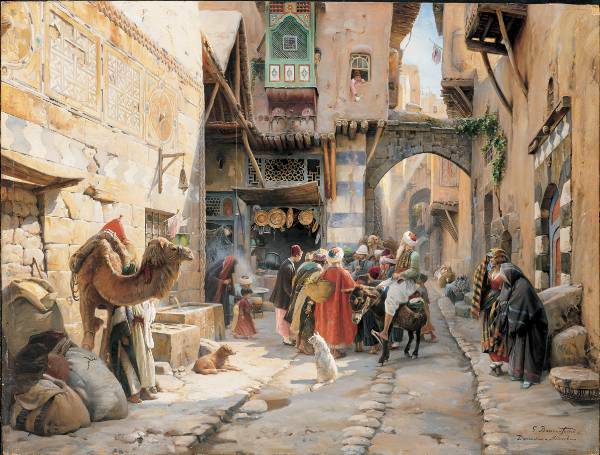 In Gustav Bauernfeind’s A Street Scene, Damascus, the artist depicted himself trying to sketch but drawing bothersome attention from passersby—even the camel in the foreground is intrigued. In Gyula Tornai’s The Connoisseurs, a group of Arab men are mystified by an Orientalist painting in front of them. 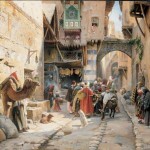 The irony today is that it is Middle Eastern art buyers who are particularly knowledgeable about the genre. His harem paintings all evoke sympathetically the tender interaction of leisurely, bored, women behind closed doors. Gustave-Clarence Boulanger’s The Courtyard of the Palace of Dar Khdaouedj El Amia, Algiers captures this intimate connection between the languid, luxuriously dressed women lounging around a pool while little girl dances dreamily, trailing her doll. America’s greatest Orientalist, Frederick Arthur Bridgman, visited Algeria at least three times, and his Preparations for the Wedding delicately captures the ambience of calm before the storm, the bejeweled bride-to-be gazes out at the viewer. This painting also exemplifies a shift toward Impressionism in later Orientalist painters, such as Edouard Verschaffelt, who moved to Algeria, married a local woman and made sympathetic and realistic portraits in an Impressionist style akin to Renoir. At the other end of the stylistic scale is the Academic master Jean-Léon Gérôme, a meticulous realist. His exquisite Blue Mosque, based on the Rustem Pasha Mosque in Istanbul, depicts variously attired worshippers against a background of shimmering blue Iznik tiles and perfectly rendered Arabic calligraphy. This attention to detail and photographic accuracy is characteristic of the ethnographic approach of the great Orientalist masters, including Deutsch. At a time when black people were not empathetically painted, Deutsch’s series of palace guards are gloriously dignified. The commanding grandeur of The Palace Guard shows Deutsch at the height of his evaluative powers and set Gabr back $1.6 million. “The buying power for Orientalism lies with the Middle East,” says Alexandra McMorrow, director of 19th-century European art at Christie’s London. “There are large amounts of money available particularly from the U.A.E. and Saudi Arabia.” Gabr says, “My competition today is formidable—I am in the same market as Gulf sheikhs, the government of Qatar, which is building a museum, as well as buyers from Texas.” Other very active investors include royal families from Morocco to Jordan, the Dahesh Museum in New York and the burgeoning regional museum structure headed up by Abu Dhabi.